I’ve been wanting to run a race in the mountains for a while. Not that easy logistically so it has taken me some time to organise. 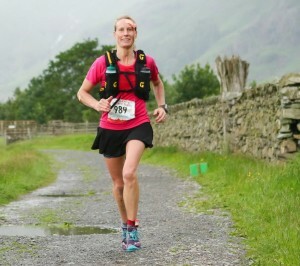 The one I chose is the Ultimate Trail 55, a 58km ultra race with 1,750m of elevation gain in the Lake District in northern England. 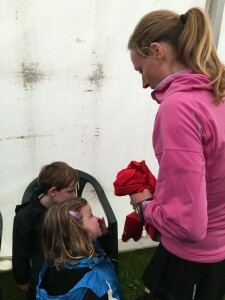 The timing was right as it took place on 2nd July, so two months after the London Marathon and two months before the big one: Echappee Belle race. Plus it was in a part of the world I’ve never been to, so it sounded like a great excuse to explore with the family. I’ve run ultra-distances before and many undulating races, but never had I attempted a real mountain race with so much ascent and descent. My goal was to have fun and complete the event and along the way to practice for Echappee Belle. A race run in the French Alps at the end of August, over a very hilly and technical mountain course. So I thought Ultimate trail would be perfect to find out if I enjoy running in such a hilly environment? And then I also want to test my gear, my nutrition strategy and my current fitness level. My hill training can be summarized as up repeats of the highest pimple around (just 15m of elevation gain!). 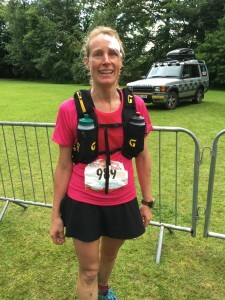 I’ve also learnt in the lead up to the race that it’s not that easy to train for mountain events living in the New Forest with its flat trails. Yes, it’s definitely hillier in the Lakes! Leaving straight after school on Friday, and after a 7-hour car journey with three tired children in the back, we arrived late in the Lake District. A short sleep later it’s Saturday morning and we’re off to the start of the race.. 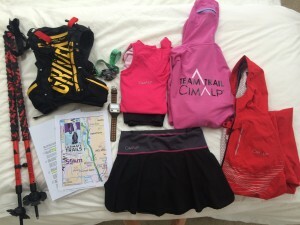 Packing for the start, thanks CimAlp for the clothing and Grivel for the backpack and poles!! The weather was looking grim (thanks Anna: I remembered to pack warm clothes for everyone! ): Strong winds of up to 35mph, heavy rain showers, poor visibility and 7C at the start. Hmmm, I didn’t quite realise this is what it would be like when I signed up for a summer race … my inexperience is really showing here! As we were lining up at the start, I looked around to see what other runners were wearing. It was drizzling slightly and the vast majority of runners had waterproof jackets. I’ve packed my CimAlp Storm jacket in my backpack, but decide to listen to my intuition. The jacket stays in my bag and it’s just a skimpy race t-shirt for me. The first 5km are uphill with 400m of elevation gain. There’s no time to get cold. Should I wear or pack my Storm jacket?! My spirits are high, I never thought I would be feeling so good and ranking so well in such a different event. But, I am aware there is still a long way to go so I don’t get overexcited. I refuel with some energy drink and a couple flapjacks, and I’m off really quickly leaving my fellow runner as I zoom out of the checkpoint. I catch up another runner and decide to follow him. After running a couple of miles together, he asks me if I know the area… “No I say, it’s my first time here. Why?” He reckons we might have got lost and gone off course. We backtrack and sure enough, we missed a turning at one of the kissing gates … we’ve just added an extra couple of miles…! And I know I’ve lost several places while we were running in the wrong direction. I try not to think about it but it plays on my mind. Wear warm layers before you get too cold and before it’s too late…. Then comes the big climb. The weather is getting really cold, it is now raining heavily and there are strong gusts of wind. As I keep climbing up to the mountain pass near Helvellyn, I am getting really really cold. I react too late and when I finally decide to get my base layer, CimAlp waterproof jacket, hat and gloves out of my pack, my fingers are so swollen from the cold that I can’t open the zip of my bag. Again my inexperience is obvious here, I should have added the layers as soon as I felt a bit cold. Now it’s too late, I can’t access my warm layers, I am shaking from the cold. I feel I am nearing hypothermia …. I push on and pass a fellow racer, an older man who’s crying the weather is so bad (he was crying before he got chicked, honest!). I shout a few words of encouragement and keep going. I have only two options: get to the next checkpoint as quickly as possible where I should be able to warm up, or call the race emergency number. I’m not willing to give up yet … so I climb as quickly as I can, head down running with my eyes half shut to minimise the rain stinging my face, fighting against the elements. 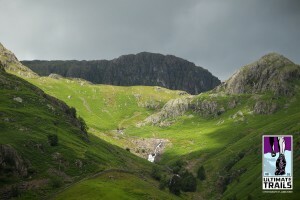 Finally, I make it to the top and start the slippery descent through streams, fells, slippery grass and rocks. I’m warming up on the descent, which is a relief. I take a second tumble on the wet ground and I can feel a little pain in my shin. No time to check, let’s push on. At checkpoint 3, my precious family is waiting for me and Alex is running to greet me. This lifts my spirits again. Rob tells me I’m now 8th lady. I am a bit disappointed I’ve lost my 4th position, but I know it’s only due to getting lost and the extra miles we put on. No woman has passed me while I was back on the course. I stumble back onto the course, and head off in the wrong direction. I am really disoriented, and everything in the left eye looks blurry? A huge thank you to these two fellow runners who helped me and bandaged me up! I would not have been to finish without them! As soon as they are finished bandaging my head and elbow, I get up and start running again. I am driven by thoughts of those close ones I love. I am now running only with my heart and soul. My body is sore and battered, covered in cuts and bruises, my legs are shaking, tears rolling down my cheeks from the emotions. I know the chance of a podium has vanished as I just spent a precious 20 minutes getting patched up. And my body is significantly weakened from the fall. But of course I still want to cross the finish line and continue the journey, for the ones I love. I just cannot give up, this is not an option. Why is everyone I pass asking me if I’m really OK and offering to call the emergency services? I can’t see my own face, but I’m guessing it looks quite bad as I see the look of puzzlement on other people’s faces…. And I keep having to wipe a steady flow of blood dripping from my head…. 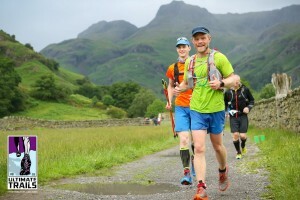 When I reach checkpoint 5 in Langdale, I am overwhelmed by the encouragement from other competitors cheering me on as I enter the checkpoint. Everyone seems to know about me?! So much support, I break into tears from all the emotions and cheers. Another enforced 20min stop with the first aider trying to control the bleeding, a new clean bandage, a bit of energy drink, a handful of sweet cakes, and I’m off again for the last 10km to the finish!! Still running to the finish… Never give up!!!! Again, I run the last 10km with my heart, trying to ignore the pain in my head and the warm blood on my face. 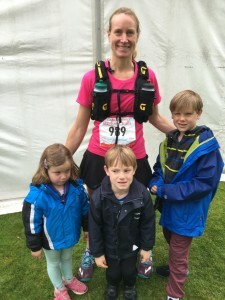 And then the finish line is in sight, I feel like I’m flying again… A perfect finish with my precious family (and mountain rescue!) waiting at the finish, and my 5-year old son Alex grabbing my hand and running together the final sprint across the line. 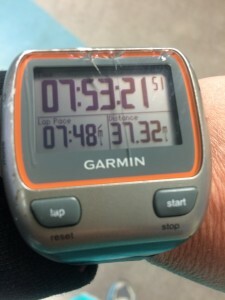 A broken Garmin screen after my fall! At least it was still working to record the 37 miles completed! Thanks to the race organisers and all the volunteers. Thanks to all the fellow runners who helped and encouraged me throughout the journey. Thanks to mountain rescue for the outstanding care. And last but not least, thanks to the ones I love for keeping me going when the going gets tough. Pleased to see you made it back in relatively one piece..
I’m one half of patch and dispatch, great time and blog BTW..
Good luck with future endeavours. Thanks again Ian for your help! Good luck to you too!!!! Hi Camille, great run and blog. I saw you again at the end in the medical tent and congratulated you. Mine was a very minor ailment and yet I was about to pass out – you were there with your ‘proper’ injuries chatting away happily! Good luck with future races. You are clearly a talented runner but, more importantly, your determination will clearly carry you a long way! Thanks for the kind words 🙂 A huge congrats on competing the 110, wow!!! That’s inspiring in itself! And thanks for the congrats in the medical tent! Good luck in your future races too!! What’s next for you?